Ricotta Pancakes Recipe - You'll love how easy they are! - Let the Baking Begin! Ricotta Pancakes Recipe – You’ll love how easy they are! A simple Ricotta Pancakes Recipe the whole family will love! Learn how to make pancakes with ricotta cheese that are crispy yet creamy with each bite you take! Ricotta Cheese is the secret ingredient to perfect pancakes! Wanting to make syrniki (Russian farmers cheese pancakes), I realized I didn’t have the proper farmer’s cheese. Determined to make something at least somewhat similar I went to the local grocery store and ricotta cheese was what I came home with. Making pancakes with the ricotta cheese turned out to be a huge success! As you bite into these pancakes it’s first crunchy, then turns into a deliciously warm and cheesecake-like creamy inside. What can I serve Ricotta Pancakes with? These delicious ricotta pancakes are so good, it’s hard to stop with just one! Paired with some sour cream and jam, you’ve got yourself a breakfast fit for a queen! Also, they are very easy to make and can be eaten hot or cold, your choice! If you really want to impress your table guests, make this super easy Cherry Pie Filling that is a year round favorite in our family! Mix together the egg, ricotta cheese, and vanilla. Add sugar mix again. Add the flour and baking powder. Mix everything together into a smooth mass. With a tablespoon or large ice cream scoop, scoop the mixture and drop into flour. Coat ball in flour, and shape into a flat patty. Heat oil in a skillet over low-medium heat. Once hot, add pancakes in. Cover with lid, fry until both sides are well browned. To serve syrniki: serve warm with a side of sour cream, a jam of choice or this homemade Cherry Pie Filling. To make the sour cream topping: combine sour cream with a little bit of sugar to make it slightly sweetened. Add more or less sugar to your liking. I do about 1/2 cup of sour cream + 1-2 tablespoons of sugar. Do you enjoy pancakes for breakfast? Breakfast is a very important part of the day. Having these ricotta pancakes for breakfast make breakfast even more important! Have you ever had ricotta pancakes or syrniki? What is your favorite way to enjoy them? Share blow! More Pancake recipe you will love! 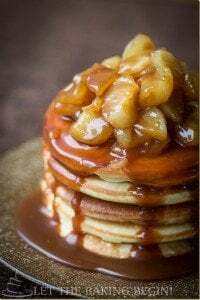 Caramel Apple Pie Pancakes – Pancakes topped with pure deliciousness! 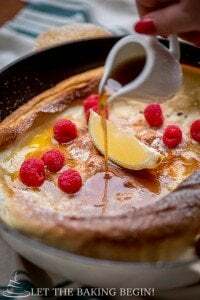 Russian Buttermilk Pancakes – A classic pancake recipe. 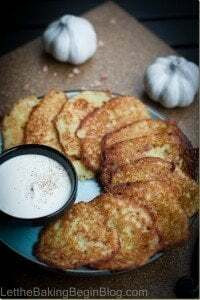 Cottage Cheese Pancakes Recipe – Simple fluffy pancakes with cottage cheese! Easy how to make pancakes recipe card you can follow and print below! A simple Ricotta Pancakes Recipe the whole family will love! How to make pancakes with ricotta cheese that are crispy yet creamy with each bite you take! 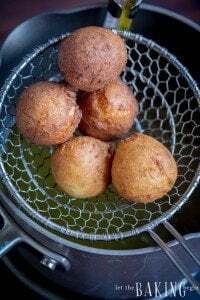 Combine the ricotta cheese with the egg and mix until the egg is well incorporated (if using vanilla add it with the egg); add the sugar and mix again; add flour and the baking powder and with a minimal amount of mixing bring everything together into a smooth mass. Using a tablespoon or a large ice cream scoop, scoop the mixture then drop it into the flour. Coat the ball in flour, then gently shape into a flat patty about 1/2 inch thick. You can shape them all and then fry the ricotta pancakes, or shape enough to fill the pan and while they’re frying continue shaping the rest. To fry the pancakes add about 1 tablespoon of oil to a skillet and heat over low-medium heat. Add ricotta pancakes in, cover with a lid and fry for about 2-3 minutes per side or until well browned on both sides. To serve: serve warm with a side of sour cream and a jam of choice. combine sour cream with a little bit of sugar to make it slightly sweetened. Add more or less sugar to your liking. I do about 1/2 cup of sour cream + 1-2 tablespoons of sugar. I have made these so many times .perfect for simple, and easy breakfast .thank you for sharing recipe. Cherry Pie Filling Recipe - Cherry Sauce - Let the Baking Begin! I haven’t personally done it, but don’t see why it wouldn’t work. Just make sure to freeze them after frying and cooling them. These are delicious! Have you tried substituting regular flour for almond? If yes, how much do you need to add? I have tried substituting, but my pancakes don’t bind when it’s time to flip them. I have not done it with almond because I already suspected it that it wouldn’t work the best. The flour is added to bind the ingredients together and to help keep them together, but almond flour does not have any gluten which will be able to bind it. I do wonder if you can make it without the addition of flour at all, then spray them with oil and bake at 350F until cooked through on the inside if you really want to make them without any flour in them. Not sure though it will work, just an idea at this point. Thanks for the star rating! Oh my goodness! 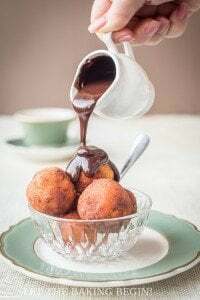 I made these this morning and they are divine ❤️ Thank you so much for sharing this amazing recipe. Thank you Michelle so much for your feedback! I’m glad you enjoyed them! These are perfect. I’m serving them for dinner tonight. Instead of sour cream we serve with plain Greek yogurt and sour cherry preserves or honey. Delicious. I love cherry preserves! Thanks for your feedback Natasha! Will this work if I swap the all purpose flour for almond flour or coconut flour?? These were really good!! We halved the recipe and had to use almond flour since we’re on a low carb lifestyle. ..perfect for those who need to adapt the recipe for gluten-free btw. We also left out the sugar and added a little vanilla and almond extracts …delicious. Even my picky husband went back for seconds. We can see how using regular flour and sugar in these would make them fabulous. .. Even though we had to slightly change it well done on this recipe! did you use all almond flour or half almond and half white flour? You said you didn’t like using vegetable oil. What kind of oil did you use? Also, a sweetened sour cream topping was mentioned. What would be the amounts of each that you would use to make such a topping? I use olive oil since that is what I use for everything. For the sour cream you just mix about 1/2 cup of sour cream with enough sugar to make it slightly sweet. It really depends on your taste. You can add more or less if you want. A tiny splash of vanilla also bring this up in flavor. Do you think these could be baked instead of fried? Do you have a temp/time recommendation? I tried these this morning and liked them. However Im not a fan of fried food so early (unless, of course, its bacon). I was wondering how they would taste if baked rather than fried. Has anyone tried this? How important is the sour cream? I was thinking of using plain Greek yogurt and jam. Not important at all. That’s just how I grew up eating it, but you can totally substitute it with Greek yogurt. Thanks for the recipe Meghan! Can these be frozen and then reheated, or made day before? I’m not sure if it can be frozen, since I have not done it myself, but I think it should be ok.
You can make the pancakes a day ahead and reheat them in the microwave or just re-heat them in the skillet for that crispy outside the day you want to serve them. What kind of jam did you use? What would you reccomend? I used black currant jam, but anything you like will work, like strawberry, rapsberry, peach, apricot – any jam really. HI! I was wondering if you use vegetable oil? Would the pancakes freeze well after they’ve been cooked? Do you thinkit would work to make the batter the night before? I made a batch the night before and the dough held up just fine for morning shaping. I had to make a second batch in the morning and you couldn’t tell the difference between the batter from the night before and the fresh batch. That’s great to know! Thanks for sharing Shana! Hi Marina. I made this yesterday and it was really delicious! My kids all loved it, and said this is their favorite kind of pancake they ever had! The taste is actually very similar to crepes with cheese filling (nalisniki), which I really enjoy… except this is so quick and easy to make. Now I always have to make sure I have ricotta cheese at home. Thank you for sharing! I so want some syrniki right now! Marina, you are SO awesome!!! and I don’t even know you in person, but I can tell! I made your ricotta pancakes this morning and my whole family loved them. I halved the recipe to accommodate my five-person family and it was enough for all of us with three left over (no one in my family eats very much:). Thank you for sharing your recipes, bloggers like you make us all better cooks! That’s great to hear Marina! I’m so happy to see people use my recipes and like them. Thank you for taking the time to come back and share your feedback! How do you half this recipe, with the egg? What do you suggest? Usually if I need to half a recipe with only one egg, I whisk the egg, measure how many tablespoons of liquid I have and then just add half. I make mine with cottage cheese. I have to try ricotta cheese too. Looks delicious Marina! My mom puts them into a baking dish after she fries them then smothers them with a sour cream/ sugar mixture and bakes it like that. So yummy! My mouth is watering just thinking of it! Oh yum! That must be so so good! Thanks for sharing Anna! I made the ricotta pancakes on Saturday morning, it was so delicious. Thank you for the great recipes and pictures. Yay! I’m so glad you liked them Lily! Haha. Gotta love when kids do that! I’m so psyched to try these since farmers cheese isn’t always available.